Last April Congress banned NASA and the Office of Science and Technology Policy (OSTP) from meeting with their Chinese counterparts. The details of the ban and the history behind it can be found in a recent commentary I published in Nature. The ban was drafted by Representative Frank Wolf, a conservative Republican from Virginia who chairs the appropriations subcommittee that controls the budget for NASA and OSTP. Subcommittee hearings on the ban made clear that Rep. Wolf’s laudable concern for Chinese human rights, especially religious freedom, prompted his action. The ban, which is likely unconstitutional, attempts to prevent the President from using scientific dialog and cooperation as an instrument of diplomacy. The reasoning behind the ban deserves careful consideration.Rep. Wolf believes government to government scientific dialog and cooperation lends an undeserved legitimacy to China’s ruling Communist Party. That assumes a high level of Chinese popular respect for the opinion of the government of the United States. While that may have been true in the late 1980s, when students erected a Chinese version of the Statue of Liberty in Tiananmen Square, it is no longer true today. And the change isn’t a product of Communist Party propaganda, since the Chinese public places about as much faith in the information they get from their politicians as many Americans place in the information they get from theirs. Many Chinese believe the U.S. government is hostile to China, not because of its human rights record, or party propaganda, but because China is a rapidly developing nation that the United States finds threatening. The mostly young, largely apolitical, Chinese scientists and engineers who are the victims of Rep. Wolf’s ban are more likely to see the ban as an attempt to hold China back, and block their access to advanced technology, than an expression of support for their personal freedom. Rep. Wolf’s subcommittee hearings lend some weight to these suspicions. U.S. fears about technology transfer are another key motivation behind the ban. I first visited China as a graduate student in the summer of 1984 and spent well over half of the intervening 27 years with my boots on the ground in the People’s Republic. Over the years I acquired the language and studied the culture, yet every day I spend here presents opportunities to learn something new, and to question my understanding of what’s happening in China. I’m currently in China at a conference about nuclear power. This evening my Internet connection went down after I tried to work around what appears to be a concerted effort by the cyberguards of the Great Firewall of China to poison the DNS of the VPN I use to login to my Facebook account. Facebook is a target of the Great Firewall but, like me, many here find ways around China’s cyberguards. The cyberguards have been extra vigilant lately in the run-up to the 90th anniversary of the founding of the Chinese Communist Party this July. 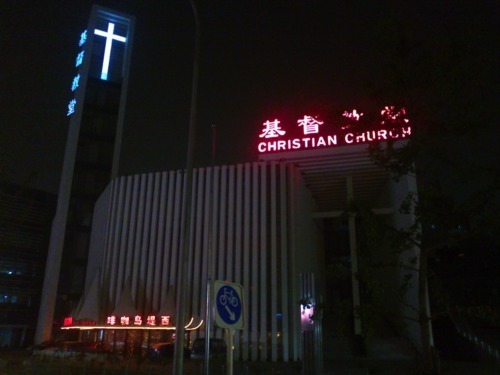 The fix this time was an alternate domain name for the same VPN and a five minute walk to a hotspot in a coffee shop in the basement of the local Christian church here in China’s silicon valley—one the wealthiest and most highly educated neighborhoods in the country. The coffee shop is just renting the space, providing a little extra income for the church, which has a large and growing congregation. The coffee shop is crowded with young, middle-class Chinese doing the same thing I am. As I get ready to hit the send button on this post, my mind turns to Rep. Wolf, and to the comments of a colleague of mine who said she had no desire to come to China, which she imagined would be akin to “visiting a giant open-air prison”. Political oppression and religious persecution occur here, to be sure, but things are not quite that simple. The impressive pace and scope of the social and economic changes underway in China should inspire a respectful caution in the minds of U.S. legislators who think they understand China, and who believe they are sending a clear and effective message to the Chinese public or the Chinese government.